DC Comics’ Brightest Day returned with a strong issue two weeks ago and we can only hope that it’s a sign of things to come for the series. In many ways the book returned to the way it began by shifting the focus around the major players that were resurrected during Blackest Night, namely Deadman, Firestorm, Hawkman and Hawkgirl. After what we felt was a marked decline, things are looking up. PTB: It Feels like it’s been a while since we did one of these. Did the book ship late or is that us? KevinMLD: Pretty sure that’s just us being slow. 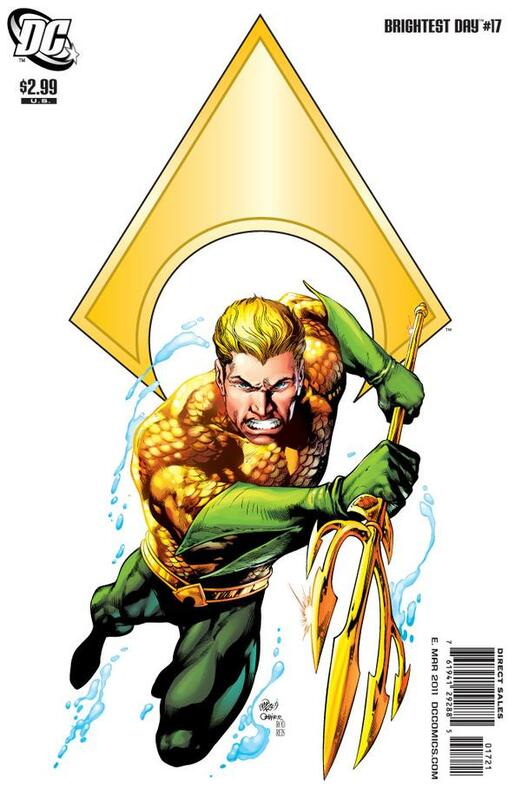 PTB: Brightest Day #17 has a special cover that’s part of January’s “focus on the characters” promotion from DC. As a result, we’re back to a Finch cover, but I think it’s only for this month. KevinMLD: Is it Finch? Inside the book they list covers by Gary Frank and Ivan Reis. 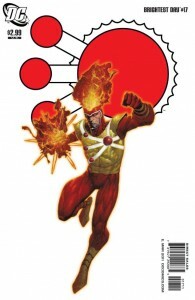 PTB: The regular Firestorm cover is listed as Finch on Comixology and to my eye there’s no doubt it’s his work. The similarly designed variant cover featuring Aquaman is by Ivan Reis. The Gary Frank listing is likely a mistake. The white covers are great and I really like this promotion, but what really impressed me is the incredible artwork inside. This one is absolutely among the best looking issues of this series. I particularly like the two-page spread of Firestorm unleashing on the Shadow Demons. KevinMLD: The interesting part is the book lists four artists but at least to me it didn’t feel like four different artists. PTB: Absolutely, it was all pretty seamless. 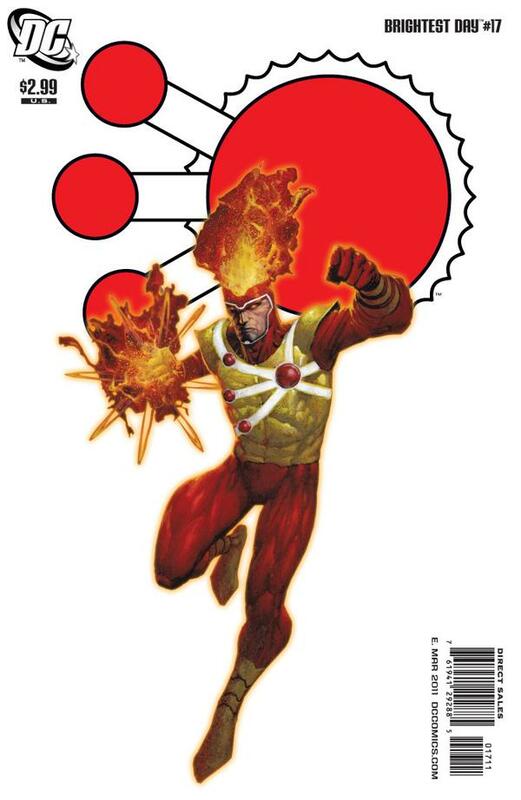 My favorite thing about the book is that we’re back to moving among multiple stories with Firestorm, Deadman and the Hawkpeople. I could have done without most of the single character issues, Deadman/Batman in issue #14 being the exception. KevinMLD: Agreed. It feels like this issue has some story telling traction to it that prior issues lacked. The idea of each issue telling multiple stories is also the approach DC took with 52, which was undeniably their most successful effort to date on one of these year-long stories. PTB: Firestorm is in pursuit of his Black Lantern counterpart, Deathstorm. The chase takes them to the planet Qward. I know they said it’s related to the Anti-Monitor, but that planet has something to do with Sinestro, right? KevinMLD: Yes, this is where his ring was forged and I believe the Sinestro Corps were at one point headquartered here. Meanwhile, The Green Lantern Corps title is currently telling a story set on Qward. It’ll be interesting to see if that all comes together at some point. PTB: The cheeseburger thing is getting beaten to death, but it’s interesting to see Deadman’s story progressing on other fronts. I don’t know if it’s got anything to do with Dove in particular but I like that his world is expanding. His story continues to be the best part of this title and I never would have expected that. KevinMLD: How old is Dove anyway? Because I thought she was like a teenager. Just asking. Deadman has always been a quirky and interesting character as far as I’m concerned. I hate them having him be such a brooding, self-hating character as he’s always seemed more carefree to me. PTB: Some of that lightness is coming through as his story progresses. I don’t know how old Dove is, but even if she’s in her twenties isn’t there a massive age difference? Why am I thinking that Deadman was a ghost for a long time? Come to think of it, would his grandfather only be 98 years old? KevinMLD: Do you age when you’re dead? That just adds to creep factor. He’s been around since the 1960s. So I’m saying he’s been dead at least ten years. PTB: The power levels rising in the white ring just as Deadman makes an ill advised motorcycle jump with his elderly grandfather seems to point to what we’ve been thinking about the new protector. KevinMLD: Agreed. 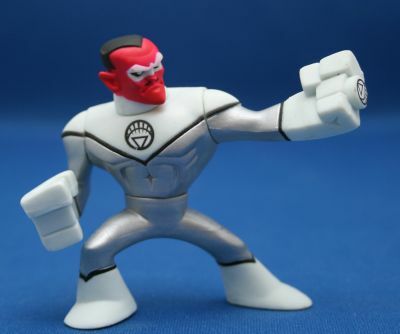 He’s totally the White Lantern, though my Action League Sinestro figure begs to differ. PTB: I didn’t hate the Hawkpeople stuff. It was somewhat interesting for what it was. It looked great, the coloring was awesome, but this Hawkgirl’s mom/love predator thing is a lot to digest. The same can be said for the Hawks’ connection to the Star Sapphires, The Predator and Zamarron. KevinMLD: The Predator is the Star Sapphires’ entity, similar to Parallax. It had been possessing people until recently in Green Lantern but Carol Ferris had established some kind of bond with it that appears to have been short-lived. The less attention we pay to the Hawks the better. This is one of their better appearances but to me they’re a giant hurdle to this series succeeding. PTB: It was impossible not to notice the advertising and backup story dedicated to DC Universe Online video game. This launched last Tuesday, is this something you’ll be trying out? KevinMLD: I will most likely not be. I just think I won’t like it. I’m not a fan of MMOs and I don’t want to pay $15 a month to play a game that won’t let me be Batman or Nightwing or Deathstroke or whoever. PTB: I completely agree here. What I’ve seen doesn’t really capture my attention and I’m far more satisfied with a game like Arkham Asylum. What about the comic that gives the backstory to DCUO? That makes the game seem very exciting. PTB: The other thing I couldn’t miss was the two page spread dedicated to “Drawing the line at $2.99” I really appreciate this effort. The move to $3.99 prices in comics has really impacted my buying habits. I don’t know that it will lead to my buying more DC books though. KevinMLD: I only wish they weren’t cutting out two pages of story to stay at $2.99. I’m only so impressed. But ultimately I’d choose 2 less pages over $3.99 comics. That price point drove me almost entirely away from buying comics because they’re not worth the money to me. I still think there needs to be a cheaper alternative out there whether it be digital or in form of manga style digests. PTB: With my local comic shop moving from their storefront, they had a massive sale last week. Most recent books were discounted to $1 and I can’t tell you how great it was to look through and pick up books I was interested in without having to worry about the price tag. KevinMLD: Agreed. $1 is a great price point. In fact, I think all digital archive books should drop to 99 cents. Especially books that aren’t otherwise collected. The major companies aren’t making good decisions on digital books yet. Hopefully, this will improve over time.